Nothing says ‘welcome home’ like unsightly holes in the walls from door knobs on doors left free to swing about. If you’re a homeowner or parent, you know how tedious it can be to keep the house in good condition. In fact, you may even be contributing to the $3.2 billion spent annually on door hardware or the $1 billion spent each year on baby proofing. From vacuuming and cleaning to curious kids and pets, there are plenty of ways for door stops to end up broken and ineffective. And, if we’re being honest, fixing or attaching door stops isn’t really something you have a ton of time for. That’s why HexCarr Industries, LLC has launched a super-convenient alternative to traditional door stops. 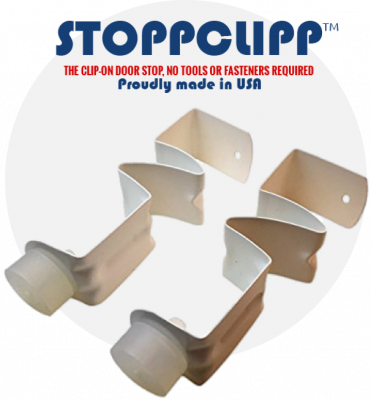 The StoppClipp® uses a patented tension clip design to attach to doors wherever impact is needed, without requiring tools or fasteners. This allows it to be placed at the top, bottom or opening side of the door in a matter of seconds. “When my twin babies were 2, they figured out how to take the rubber grommets off of the spring door stops in my home, and later how to unscrew the springs. Without stops on the doors, the door knobs began puncturing the walls,” said Jose Carreon, owner and partner of HexCarr Industries, LLC. StoppClipp®’s ability to be placed in a variety of positions makes it an extremely versatile door stop solution. When placed high up on the door, it stays out of the reach of kids and pets and may reduce choking hazards. Its adjustable point of impact also enables it to protect furniture located between the door and the wall. 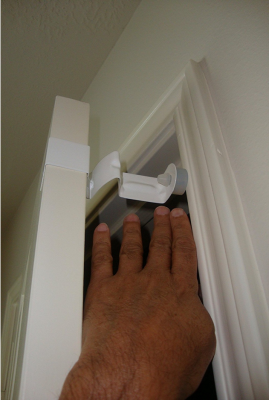 When turned to face the door opening, the StoppClipp® also serves as a pinch guard to keep the door from closing and prevent lock-ins. StoppClipp® is already making headlines and has been featured in a variety of publications, including Real Simple magazine. Positive online reviews show customers are finding value in this exciting yet practical product. Made in two sizes, StoppClipp® works with US standard sized doors: 1 3/8″ for interior doors like those for rooms, closets, restrooms and pantries, and 1 3/4″ for exterior doors. Want to learn more? Check out HexCarr’s crowdfunding campaign here – https://www.fundable.com/stoppclipp. The team is offering their innovative product at wholesale price – get them while they last!